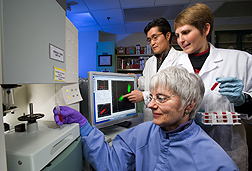 Using a flow cytometer, chemists Norberta Schoene (foreground), Renee Peters, and Jae Park measure P-selectin expression on platelets in mouse blood. After screening hundreds of phytochemicals found in a variety of plants, an ARS scientist has identified, characterized, and synthesized two potentially heart-healthy natural compounds. These compounds, either in foods or as dietary supplements, may be important for alleviating the symptoms of heart disease related to blood clots. Rigorous testing and regulatory approval is prerequisite. The research was conducted by ARS biochemist Jae B. Park at the Beltsville ( Maryland) Human Nutrition Research Center’s Phytonutrients Laboratory. Park presented the findings at the 2005 annual meeting of the Federation of American Societies for Experimental Biology, in San Diego, California. The chemical structures of the compounds and their biological activities were filed in a 2005 patent application. The natural compounds that were synthesized are N-caffeoyldopamine and N-coumaroyldopamine, and their analogs, which are found in sweet peppers, Chinese wolfberry, and cocoa. When tested in larger quantities than likely found in foods, these compounds suppress the mechanism whereby blood platelets stick to blood vessel walls. Platelets play an important role in blood clotting. They release chemicals that cause the cascade of events that form plugs at the site of injury within blood vessel walls. Park found that the compounds significantly suppress an adhesive molecule, P-selectin, that “glues” platelets to white blood cells and blood vessel walls. White blood cells, or leukocytes, move through vessel walls to damaged areas, where they surround and isolate dead tissue and foreign bodies and also produce antibodies. During the aging process, fatty substances in blood plasma can accumulate inside blood vessel walls. These fat deposits trigger cells to release molecules that cause a chain of events in which immune cells, proteins, and calcium in the bloodstream also adhere to the blood vessel’s inner wall. All these substances combine to form plaque. Plaque buildup can obstruct arteries and lead to blood clotting. “Blood clotting causes the artery to narrow even more, and in some cases, prevents the blood from supplying the heart muscle, which results in a condition called ‘acute coronary syndrome,’” says Park. To test the biological activities of the compounds, Park collected blood from mice and exposed it to the compounds. He then studied the compounds’ effects on P-selectin expression and platelet-leukocyte interactions. “The compounds were found to be potent in their ability to inhibit chemical reactions that lead to blood clotting, such as platelet activation and platelet-leukocyte interaction,” says Park. While it’s long been known that plant chemicals promote health, they have not been measured in foods to the extent that the essential vitamins have. Therefore, it is unknown whether the quantity of the newly studied compounds normally present in foods is enough to elicit the suppression response. Park is now measuring the compounds in plant sources using newly developed analytical methods.—By Rosalie Marion Bliss, Agricultural Research Service Information Staff. This research is part of Human Nutrition, an ARS National Program (#107) described on the World Wide Web at www.nps.ars.usda.gov. Jae B. Park is with the USDA-ARS Phytonutrients Laboratory, 10300 Baltimore Ave., Bldg. 307-C, Room 133, Beltsville, MD 20705; phone (301) 504-8365, fax (301) 504-9456. "Plant Compounds Inhibit Blood Clotting" was published in the January 2006 issue of Agricultural Research magazine.